Suppose you have a table that stores the ProductID for all products in a mini store. You want to get Productname for a particular ProductID. Look at the following example; We declared a variable @ProductID and specified value 1 for it. In Case statement, we defined conditions. Once a condition is satisfied, its corresponding value is returned. Similarly, if we change the condition in a Case statement in SQL, it returns appropriate expression. In the following example, we want to get Product name for ProductID 4.it does not satisfy Case statement condition; therefore, it gave output from Else expression. Let us explore a few examples of the Case statement in SQL. Before we proceed, create a sample table and insert few records in it. We have following records in Employee table. In this format, we evaluate one expression against multiple values. In a simple case statement, it evaluates conditions one by one. Once the condition and expression is matched, it returns the expression mentioned in THEN clause. Usually, we store abbreviations in a table instead of its full form. For example, in my Employee table, I have used abbreviations in Gender and StateCode. I want to use a Case statement to return values as Male and Female in the output instead of M and F.
Execute the following code and notice that we want to evaluate CASE Gender in this query. In the following image, you can notice a difference in output using a Case statement in SQL. In this format of a CASE statement in SQL, we can evaluate a condition using comparison operators. Once this condition is satisfied, we get an expression from corresponding THEN in the output. We can see the following syntax for Case statement with a comparison operator. Suppose we have a salary band for each designation. If employee salary is in between of a particular range, we want to get designation using a Case statement. In the following query, we are using a comparison operator and evaluate an expression. In the following image you can see, we get designation as per condition specified in CASE statement. We can use Case statement with order by clause as well. In SQL, we use Order By clause to sort results in ascending or descending order. Suppose in a further example; we want to sort result in the following method. We can define this condition with a combination of Order by and Case statement. In the following query, you can see we specified Order By and Case together. We defined sort conditions in case expression. We can use a Case statement with Group By clause as well. Suppose we want to group employees based on their salary. We further want to calculate the minimum and maximum salary for a particular range of employees. In the following query, you can see that we have Group By clause and it contains i with the condition to get the required output. We have following output of this query. In this output, we get minimum and maximum salary for a particular designation. We can use a Case statement in SQL with update DML as well. Suppose we want to update Statecode of employees based on Case statement conditions. In the following code, we are updating statecode with the following condition. Execute the following update command to fulfil our requirement using a Case statement. In the following output, you can see old Statcode (left-hand side) and updated Statecode for the employees based on our conditions in the Case statement. We can insert data into SQL tables as well with the help of Case statement in SQL. Suppose we have an application that inserts data into Employees table. We get the following values for gender. We do not want to insert value 0 and 1 for Male and Female employees. We need to insert the required values M and F for employee gender. In the following query, we specified variables to store column values. In the insert statement, you can we are using a Case statement to define corresponding value to insert in the employee table. In Case statement, it checks for the required values and inserts values from THEN expression in the table. In the following screenshot, we can see newly inserted row contains Gender M instead of value 0. 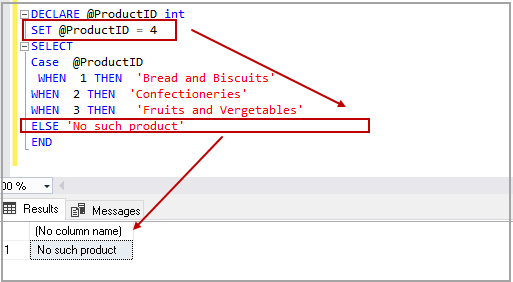 The Case statement in SQL provides flexibility in writing t-SQL for DDL and DML queries. It also adds versatility to SQL Server queries. You should practice Case statement in your queries.